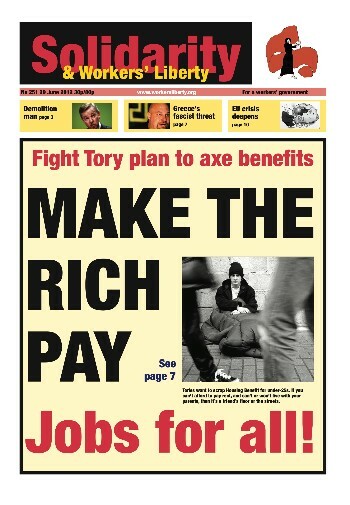 Fight Tory plan to axe benefits! Back to that first International? Iran: support imprisoned labour activists! London bus strike: "About more than the Olympics." The ISG and the "Marxist tradition"
After a serious of localised industrial actions, Spanish coal miners, in the main mining regions of Asturias and Castile and León, went on indefinite strike on 29 May. This is their response to the announcement by the right wing government of Mariano Rajoy that subsidies to the coal mining regions will be massively cut, in effect announcing his intention to close down the industry. The GMB union has launched a landmark legal challenge against contractor Carillion, after evidence emerged that it had been involved in large-scale blacklisting of trade union activists in the construction industry. The case is part of a wider labour movement campaign on the issue, blown open by the revelation in January 2012 that the shadowy “Consulting Association”, a data collection company used by numerous construction industry contractors, was holding files on over 3,000 workers containing information that could only have come from the police or other security services. On 22 June hardly any students made it into the college I work at because of the strike. I went down to my local picket line during my lunch break; it was the best picket line I’ve ever been to. There were at least 40 there when I went, and apparently it was much bigger earlier. There was a very lively atmosphere and people were willing to try and stop the scab-driven buses that were coming out. There were some attempts to block them, people shouted "traitors" at the drivers and they opened the bus doors to properly argue with them. The Fire Brigades Union (FBU) met in Blackpool last week for what (with one exception) was a fairly quiescent special conference, with the union’s Executive Council carrying all the motions it proposed. Delegates discussed the continued loss of frontline firefighter jobs – over a thousand a year — and the impact these would have on emergency fire cover in local communities. There are a number of local disputes brewing over cuts. The union announced dates for five strikes in Essex, starting from 28 June in a long-running dispute about cuts to the service. Workers in various London transport companies and grades are planning industrial action as union efforts bring long-running demands to a head. A machine that will not sway in its quest, our daily lives to control. control of all of our thoughts. Capitalism, an alienated system of profit, of greed and of war, has but one single desire. Pandelis Pouliopoulos (1900-43) was the first general secretary of the Greek Communist Party (KKE) and a founder of the Trotskyist movement in Greece. As a young law student, Pouliopoulos joined the Socialist Labour Party of Greece (SEKE), the forerunner to the KKE, in 1919. The following year he was conscripted to fight in the Greek-Turkish war and was arrested in the final year of the conflict in 1922 for anti-war activity. John Grahl (Professor of European Integration at Middlesex University) spoke to Martin Thomas. What is likely to come out of the 28 June EU summit? There is not likely to be much movement. There may be some acceptance of moving towards a banking union. It would isolate the problem of instability and possible insolvency of banks from the financial problems of the member states. Whether Germany is prepared to move fast on that, I don’t know, but it seems to be what the European Commission and some of the member states will be pushing for.